Disneyland Park opened its gates for the first time ever on July 17, 1955. Since that notable date in history, Disneyland has grown, expanded, and renovated countless times making it the enticing vacation point that it is today. For some people, however, Disneyland is not just a vacation spot. The rich history that Disneyland holds along with the captivating attractions within its gates is why we, the Disneyland fans, visit it as much as we do. 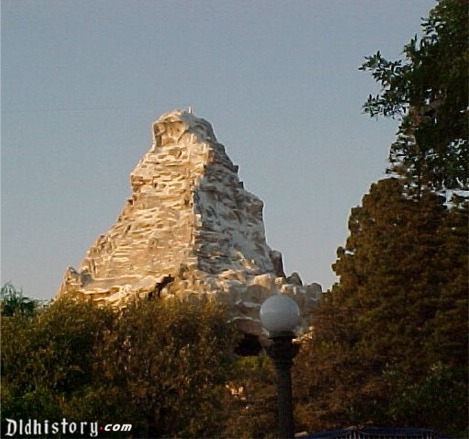 One well distinguished icon of Disneyland Park is attraction Matterhorn Bobsleds. Matterhorn Bobsleds is an expeditious ride through the slopes of the Matterhorn inside a toboggan. While racing through the ice caverns of the mountain, the rider comes in a few confrontations with the legendary Abominable Snowman. To say that this description of the ride is everything that Matterhorn Bobsleds would be untruthful. Matterhorn Bobsleds, like Disneyland Park, holds a copious history of its own. Matterhorn Bobsleds was one among many attractions included in the first major expansion of Disneyland Park in 1959. Matterhorn Bobsleds opened to the public on July 14, 1959. Other rides that premiered that day were the Disneyland Monorail and the original Submarine Voyage. Matterhorn Bobsleds was the first ever "thrill" attraction at Disneyland Park. It was also the first roller coaster ever in the world to utilize a tubular steel track and an electronic dispatch system. This ground-breaking affair changed Disneyland and theme parks all around the world. The electronic dispatch system allowed more than one vehicle to be on the track at one instance. When Disneyland first opened in 1955, Holiday Hill was in the place of Matterhorn Bobsleds. The site served to separate Fantasyland from Tomorrowland. Also, from 1956-1959, it featured an infamous, unattractive support for the Skyway attraction. Holiday Hill was known to be a nighttime hangout to young couples back in the 1950s before Matterhorn Bobsleds existed. During the construction of Matterhorn Bobsleds, the Skyway remained in place and the mountain was built around the support. The Skyway attraction passed directly through the Matterhorn Mountain as it made its excursion from the Fantasyland Skyway Station to the Tomorrowland Skyway Station. The Skyway attraction closed in 1994. The passages inside Matterhorn Bobsleds that the Skyway had passed through have since been modified. Since its debut, Matterhorn Bobsleds has been one of the most popular attractions at Disneyland Resort. Matterhorn Bobsleds is exclusive to Disneyland Park, as it cannot be found at any other Disney Park. It is the inspiration behind the other mountain attractions featured at all Disney Parks. These other attractions include Space Mountain, Splash Mountain, and Big Thunder Mountain Railroad. Standing 147 feet in the sky of Anaheim, California, Matterhorn Bobsleds is one of the first things that guests driving to Disneyland Resort are able to see. Until the addition of The Twilight Zone: Tower of Terror at Disney's California Adventure Park in 2004, Matterhorn Bobsleds was the tallest structure at Disneyland Resort. The Hollywood Tower Hotel structure of the Tower of Terror surpasses the height of Matterhorn Bobsleds, standing at 183 feet tall...only 36 feet taller than Matterhorn Bobsleds. The attraction was inspired by the live-action Disney film Third Man on the Mountain. Filmed in Switzerland, the film features scenes on and around the real Matterhorn in the Swiss Alps. Matterhorn Bobsleds was built to be 1/100th the size of the real mountain. Matterhorn in the Swiss Alps is 14,700 feet tall, and the Matterhorn Bobsleds attraction is 147 feet tall. In 1978, Matterhorn Bobsleds went through a transformation. This transformation included the addition of the ice crystals and elements from the "Wells Expedition," which was a tribute to Walt Disney Company president, Frank Wells. The update also consisted of the addition of "Harold," the Abominable Snowman. Although updates to an attraction at any Disney Park can be a disappointment to some fans, this is a rare update that completely improved the attraction and made it the memorable attraction that it is today. Matterhorn Bobsleds also holds a number of well-known "secrets." One of the most famous secrets known by Disney fans is that there is a basketball court inside the attic of Matterhorn Bobsleds. This is indeed a true fact about the attraction. Access to the basketball court is only readily available to cast members of Disneyland Resort. The backboard of the basketball court is mounted on a staircase leading to the peak of the mountain which is used by whoever portrays Tinkerbell during a firework display. One interesting fact about Matterhorn Bobsleds is that members of the Disneyland Resort horticulture team must use cranes to maintain the landscaping on the mountain. This landscaping is what creates the "timberline" of Matterhorn Bobsleds. With its abundant history and interesting facts, Matterhorn Bobsleds is not just an attraction that one rides during their visit to Disneyland. Holding the knowledge of the history of an attraction seamlessly enhances your visit to it. It's like visiting an old battle ground from the American Revolution. So many things have happened, new things arose from it, and it holds valuable history.